A picture of the attorney in front of a wall of law books that have never been opened or sitting behind a huge desk with the scales of justice prominently displayed. A paragraph outlining the attorney's areas of legal expertise. A really long paragraph about where the attorney went to law school, being on the Moot Court Team or Law Review (does anyone know or care about what that even is besides other attorneys? ), and a laundry list of amazing legal feats, awards and clerkships. One sentence about their personal life--usually loving to read, enjoying the outdoors and spending time with loved ones. So boring. So impersonal. So typical attorney. I'm different. I grew up in Colorado Springs. I graduated from Doherty High School where I played tennis and wrote for the school newspaper. After high school I spent two years in the Dominican Republic as a missionary for my church. It was there that I realized I wanted a career where I could help other people. I knew I wanted to be an attorney. I attended Brigham Young University where I met the beautiful blonde in the picture above. Six weeks after our first son was born, we loaded up a small U-haul truck and moved to San Francisco where I attended Golden Gate University School of Law. While in law school, I was on the Moot Court Board and interned for two San Francisco Superior Court judges (I know that we've established that you probably don't care). After passing the Californian Bar Exam, I went to work for a large asbestos litigation firm in San Francisco. I represented amazing men and women who were exposed to asbestos during their years in the military or while building much of the Bay Area. I loved the people who I represented. That job reaffirmed to me the need for good, caring attorneys. After nearly ten years in San Francisco, we loaded up a bigger U-haul and moved our now family of six back to Colorado. 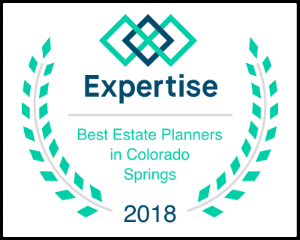 I spent three years with a local estate planning firm, before deciding to start my own firm. Of course, in my spare time I enjoy reading, being outdoors and spending time with my wife and kids. I understand people want an attorney who is professional, accomplished and respected. I would want the same thing if I needed an attorney. I also know how important relationships are, especially with legal planning. Estate planning involves talking about subjects that can be uncomfortable. It requires being open and vulnerable. I've found that when clients know me on a personal level, opening up about death and family problems is a little bit easier.